Arguably one of the finest sounding small diaphragm tube microphones in the industry, the ELA M 260 is now available in matched sets allowing for a variety of different stereo microphone techniques. 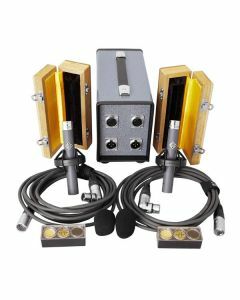 Developed for use on acoustic instruments and classical ensembles, the ELA M 260 STEREO SET features two complete microphones, each provided with TK60 cardioid, TK61 omni and TK62 hyper-cardioid capsules, two 25’ tube mic cables, two elastic shock mounts and a custom dual 960S power supply capable of powering both microphones at the same time. The entire system is packaged in a locking flight case. The small diaphragm ELA M 260 has become a staple for use in a multitude of recording applications due to its natural presence and high level of detail and clarity, especially in acoustic and classical applications. Keeping this in mind, Telefunken Elektroakustik is now offering the ELA M 260 Stereo Set. The matched Stereo Set comes in a custom locking flight case that carries both M801 cables, M761 shockmounts, microphones, wooden boxes, and an American-made dual-channel M960S power supply unit. This newly designed power supply is fully regulated and will power one or both microphones simultaneously, and features a slow-ramping heater voltage to ensure vacuum tube longevity. The ELA M 260 Stereo Set also features two sets of 3 interchangeable capsules: the TK60 cardioid, TK61 omni, and TK62 hypercardioid, so the user can have the flexibility to record their source material in any way they wish. The microphones will also feature the same flint gray finish made popular by the R-F-T AR-51, so you will be able to know in an instant, which microphones are from your Stereo Set, and which are your individual ELA M 260 systems. The ELA M 260 features an amplifier circuit based around a New Old Stock (NOS) EF-732 / 5840W vacuum tube and a custom output transformer that is wound to exacting specification in the United States. Each of these components is rigorously tested in our laboratory prior to installation, and hand-selected for matched pairs. The capsules have matched frequency responses, the tubes have matched gain and noise specs, and the amplifier circuits have matched gain and frequency response. Stereo recording techniques include X/Y coincidental pairs with the microphones in cardioid, and A/B spaced pairs with either cardioid or omni-directional patterns. Using these techniques, or others, in conjunction with a pair of ELA M 260’s will result in an ideal recording set up for string sections, acoustic guitar, drum overheads, or as room microphones. The ELA M 260 Stereo Set offers the user the knowledge and comfort that the tools they are using will give identical responses for their most important stereo recording. All ELA M 260 STEREO SETS are supplied with two sets of three interchangeable capsules: the TK60 cardioid, TK61 omni, and TK62 hyper-cardioid. With all three capsules the user can have the flexibility to record their source material in any way they wish. Each system also includes a M960S dual power supply, 2x M801 25’ dual-shielded TX-7 tube microphone cable, 2x M761 elastic shock mount, 2x wooden microphone boxes and locking flight case.